For some years now, policy debate around reform of the employment tribunal (ET) system has been befuddled by confusion – some of it inadvertent, some of it wilful and malevolent – about whether the system’s workload should be measured in terms of the number of claims, or the number of cases – which includes the relatively small number of multiple claimant cases consisting of tens, hundreds or even thousands of claims. In 2011 and 2012, the Conservative/Liberal Democrat Coalition grubbily presented its erosion of the legal protection against unfair dismissal and introduction of hefty tribunal fees as necessary responses to ever-rising numbers of ET claims, even though the number of ET cases (mostly comprised of single claims by individual workers) peaked in the last year of Gordon Brown’s Labour government and fell in each of the Coalition’s five years, reaching a near-historic low even before the evisceration from July 2013 onwards due to fees. With both claim and case numbers having hit rock bottom since the introduction of both fees (in July 2013) and Acas early conciliation (in May 2014), and the Ministry of Justice having switched to regarding case rather than claim numbers as the most meaningful measure of the ET system’s workload, the distinction has become somewhat less significant, and last month I paid little more than cursory attention to the latest set of quarterly ET statistics, covering the period July to September 2015. For the number of cases was remarkably similar to previous quarters. Move along, nothing to see. Clearly, LGBT and ethnic minority workers cannot afford to challenge workplace harassment and discrimination any more than disabled workers. However, when it came to summing these and other monthly figures to add Q2 2015-16 to the following chart, I noticed something my cursory study of the Ministry’s spreadsheets in December had missed. Whereas in most discrimination jurisdictions the claim numbers were little different to those in previous months, as shown above, the number of age discrimination claims shot from 93 in May and 85 in July, to 11,415 in September. 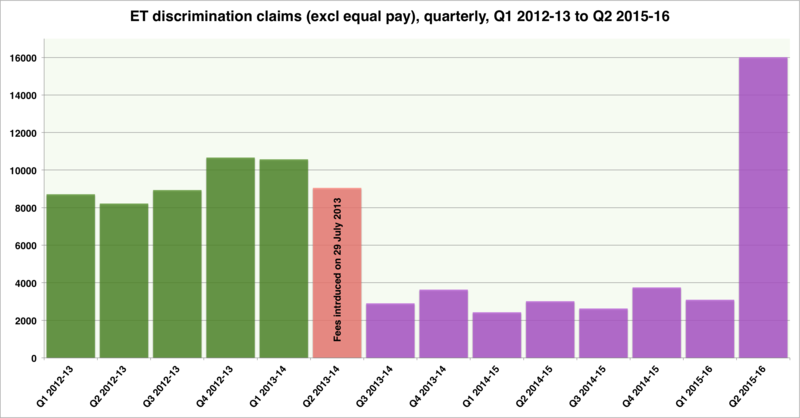 With the result that the total number of discrimination claims, not including equal pay claims, rocketed from 875 in May, and 1,047 in July, to 14,020 in September. From which – especially if you are, say, a super-intelligent but rather slow-reading Parliamentary Under-Secretary of State for justice, or a crack reporter at HR Director, the Solicitor’s Journal or the Law Society’s Gazette – you might conclude that the ET caseload has finally ‘rebounded after its post-July 2013 slump’ as ‘claimants adjust to the fees’. Except it hasn’t, of course. Claim numbers don’t just leap from a 12-month average of 80, to 11,415 – at least, not in any meaningful way. My first thought was that it must be a data input error (of which there were several in the previous quarter’s set of statistics). 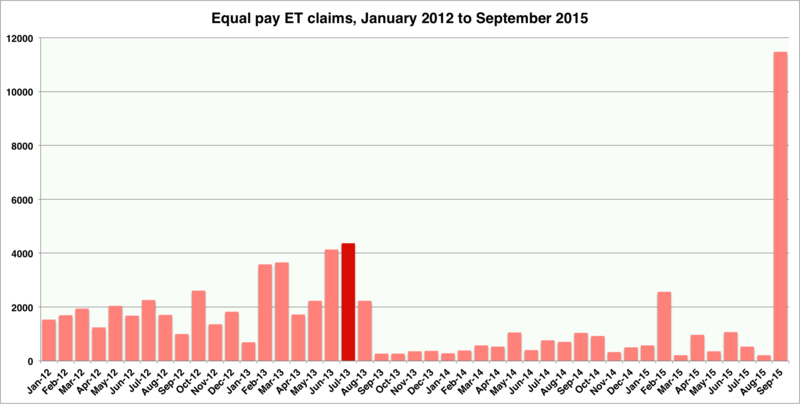 But then I looked at the figures for equal pay claims, and saw that they also rocketed, from 359 in May and 529 in July, to 11,471 in September. Yet, over the same period, the total number of ET cases fell, from 1,555 in May 2015, to 1,453 in August, and 1,433 in September. How does that fit with the stellar increase in age discrimination and equal pay claims in September? All of which is a rather long-winded way of saying it’s about bloody time HMCTS started breaking down its figures for jurisdictional claim receipts, so as to distinguish between ‘single claim receipts by jurisdiction’ and ‘claim in a multiple claimant case receipts by jurisdiction’. We have these things called computers these days, which can easily make such distinctions, at minimal cost. We should use them.